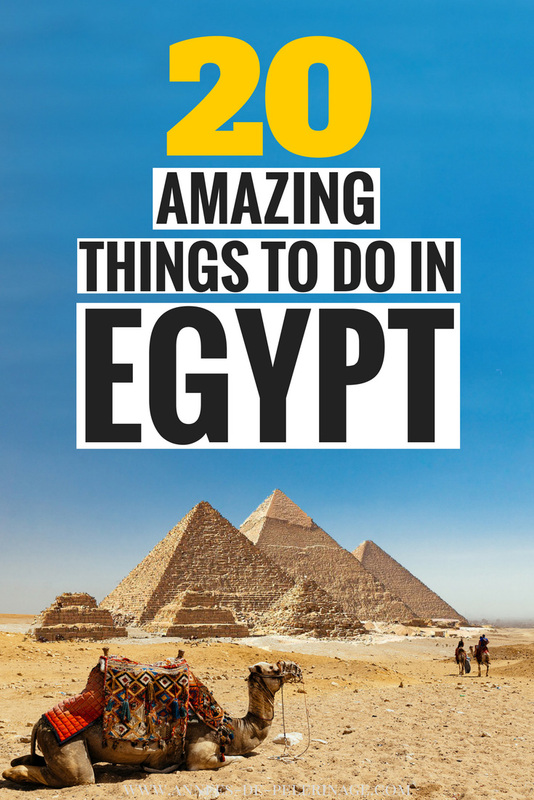 A massive list of the best things to do and places to visit in Egypt. Where to go, what to see and when to visit all these ancient tourist attractions. Are you currently planning a trip? And are you wondering what are the best places to visit in Egypt? You are probably not alone. Egypt has gigantic monuments as old as 6,000 years and Cairo, with its 22 million inhabitants, certainly has to offer an abundance of unique points of interest and tourist attractions as well (check out my guide to the best tourist attractions in Cairo). But there are very few comprehensive travel guides on the internet. That’s why I compiled a massive list of the best things to see in Egypt. This is not your standard list of pretty pictures of the pyramids. Instead, I made sure to ask all the local guides, guides who earn their livelihood by showing the great wonders of Egypt to international tourist, about their favorite landmarks in Egypt and ranked the various tourist attractions accordingly. 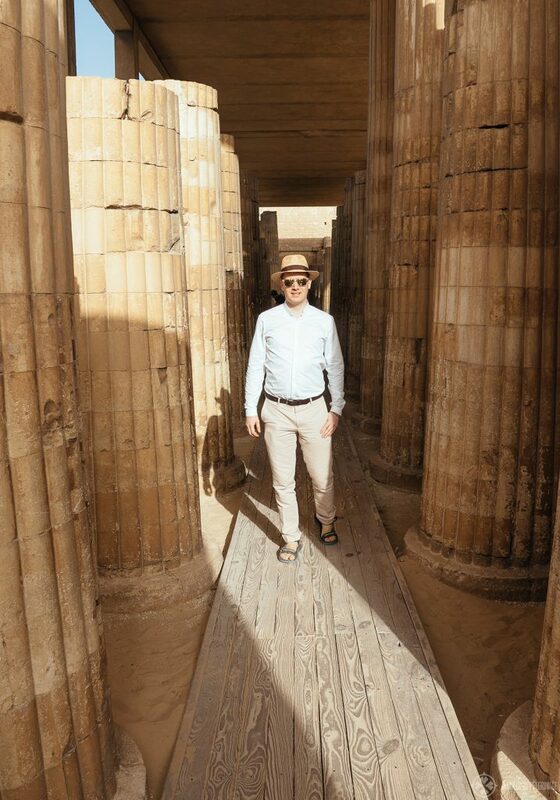 Before your trip, you should also read my guide on what to wear in Egypt, as it’s not always as simple as you’d think it is! But let’s dive right in my Egypt travel guide! 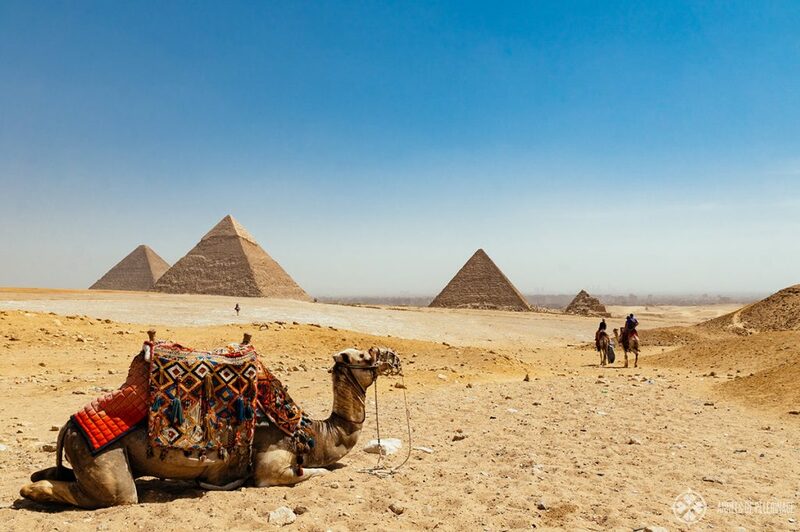 No trip to Egypt is complete without visiting the Pyramids of Giza. It truly is and will always remain THE must see in Egypt. While there are over 120 pyramids in the country of the Pharaohs, the ones around the Giza necropolis are the largest, (almost) the oldest and certainly the most perfect ones. There are many camel rides available around the pyramids. Best come with a local guide who can show you around. Read my full guide to the Pyramids of Giza here. You can even get inside the pyramids, but you will need an extra ticket. The climb inside the Pyramid of Kofu is somewhat claustrophobic, quite steep and it will be extremely hot inside. There isn’t much to see, except an empty coffin, but I still felt it totally worth the 300 EGP as there is some weird and quite massive spiritual weight to be felt in the innermost chamber. The famous Sphinx, while technically speaking belongs to the same complex, requires you to drive down a little bit into the valley. Naturally, that shouldn’t keep you from visiting this ancient monument. There is even a (somewhat kitschy) sound & light show every evening you may want to check out. There are two reasons we know so much of ancient Egypt. The dry & preserving Egyptian climate and the elaborate burial practices of the Pharaohs. You probably have heard of Tutankhamun and Ramses II, but they certainly weren’t the only Pharaohs from the so-called New Kingdom. They all have something in common though: They were buried in the valley of Kings on the west bank of Luxor. To see all those reliefs and murals from 4,500 years ago is truly a sight like no others. While all tombs were looted to some degree and some even were never finished, you really shouldn’t miss climbing into the deep shafts and right into history. Certainly one of the best places to visit in Egypt! Some murals are so clear, with such intense colors it is almost impossible to believe they are that ancient. It really pays off to get a local guide or at least read a bit about the Ancient Egyptian burial practices in advance. The texts and depictions on the walls are quite complex and your visit will be so much more intense if you got a basic understanding of what’s going on in all the scenes. 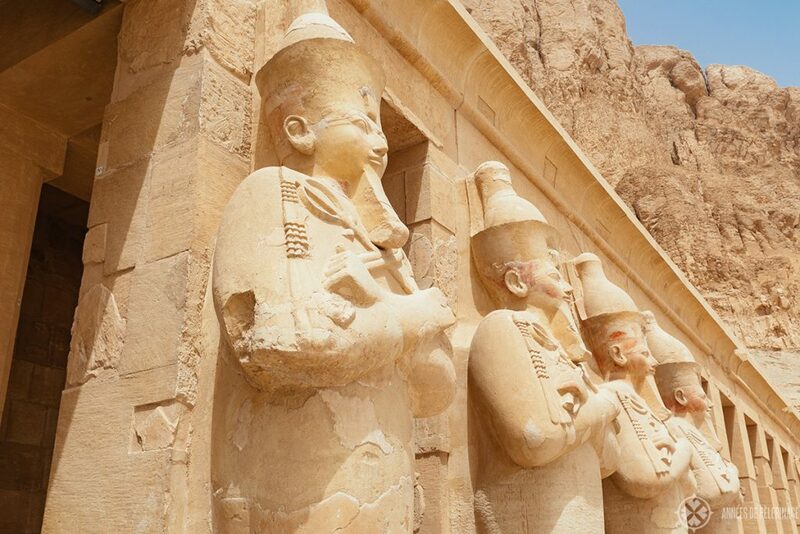 If you’d like to see how I incorporated a visit to the valley into my Egypt itinerary, click here. Hint: The ticket allows you to get into three tombs, so you might want to buy two tickets. The tombs of Ramesses VI and Tutankhamun require separate tickets. 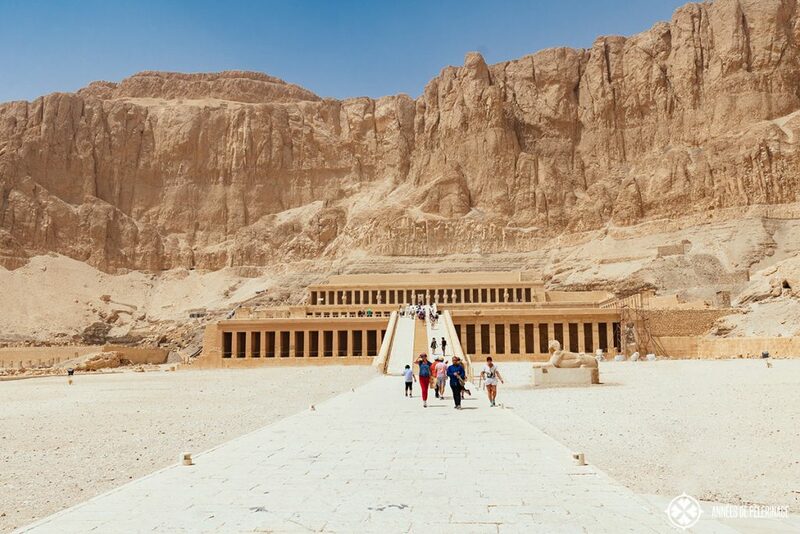 There is also a hiking trail to see Hatshepsut’s temple from above. 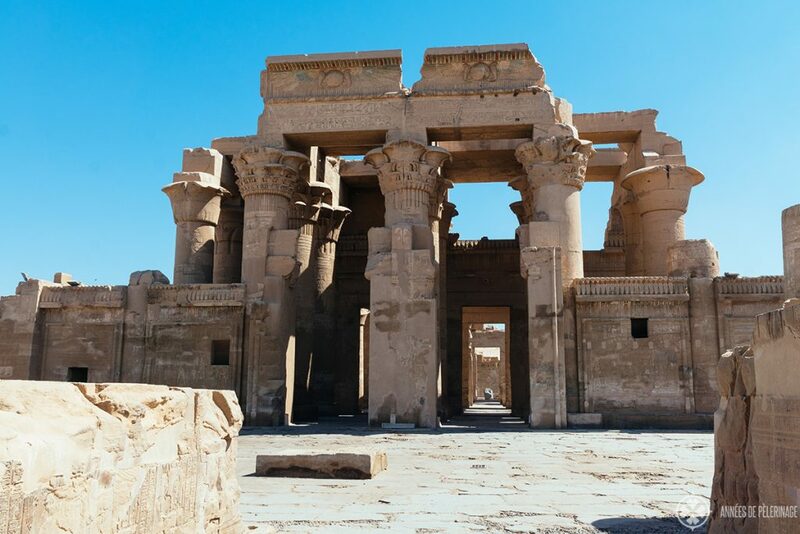 The temple of Philae is the single most intact temple in all of Egypt. It is also the site where (probably) the last hydrographs were ever written. 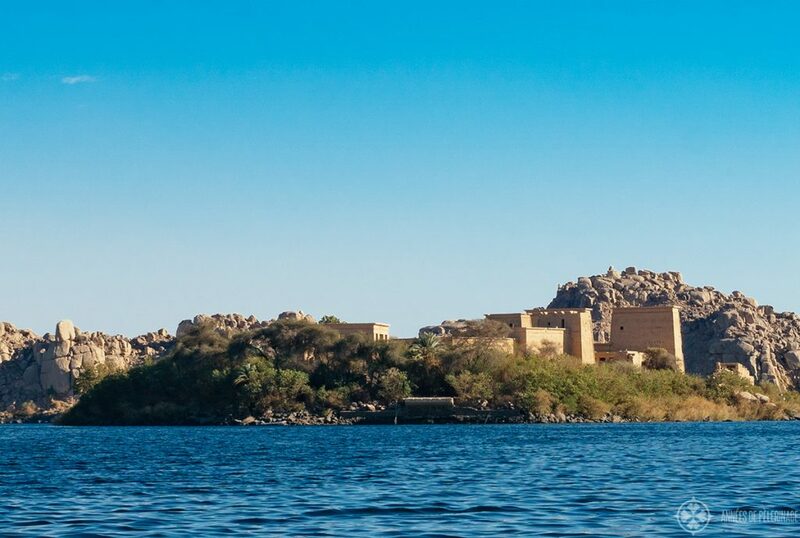 Dedicated to the goddess of Isis, Philae is located on a small island just a few kilometers in front of the grand Aswan High Dam. It was relocated to rescue it from the floods after the dam was finished to another island some 300 meters nearby. With success! To me, Philae appeared to be the image of Elysium, like one of the Isles of the Blessed. It’s by far the most beautiful place in Egypt. Tip: There is a sound & light show every evening. While incredibly kitschy, I thoroughly enjoyed seeing Philae in another light. So, if you are looking for some things to do in Egypt at night, this will be one of your best options! There is also a small, and lesser known temple of Nefertari right next to it. Both temples are rather rustic inside. Simple murals and reliefs telling of Ramesses (battle) prowess. The line of statues inside the sanctuary is quite impressive as well, though. 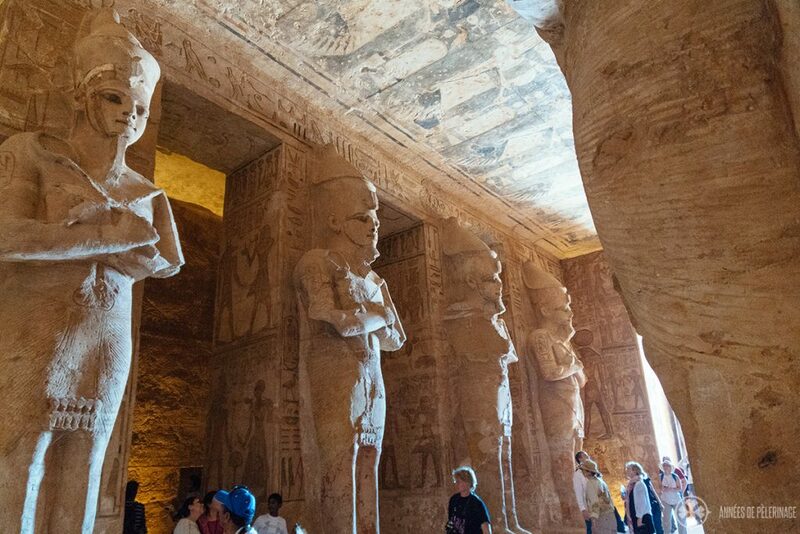 -> read all about my visit to Abu Simbel here. 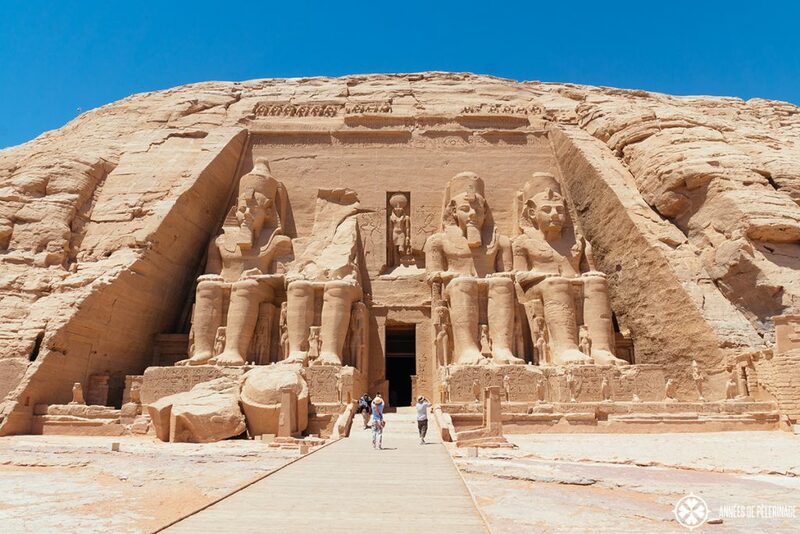 Is it worth visiting Abu Simbel? For me, it was on my bucket list ever since my earliest childhood (i was one of these kids who devoured history journals *lol*). Seeing it in person was worth the quite high price (~250 USD). I stood in front of those colossal statues of Ramesses II with jaw gaping wide open. -> Here is my guide on the best way to fit a trip to Abu Simbel into your Egypt itinerary. 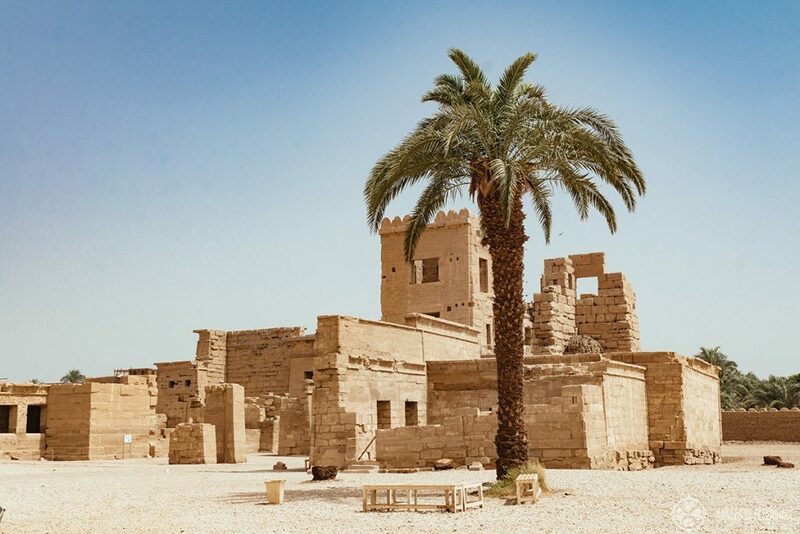 Probably one of the most remote places to visit in Egypt is the Siwa Oasis. It’s considerably hard to reach and not exactly on the most common tourist’s routes, but so worth it. My guide in Luxor called it his favorite place in Egypt, as it’s still more or less the real deal. Pharao Djoser is said to have built the first true step pyramid in history around the 27th century BC. The ancient monument is surrounded by a huge burial complex and various smaller pyramids and tombs. 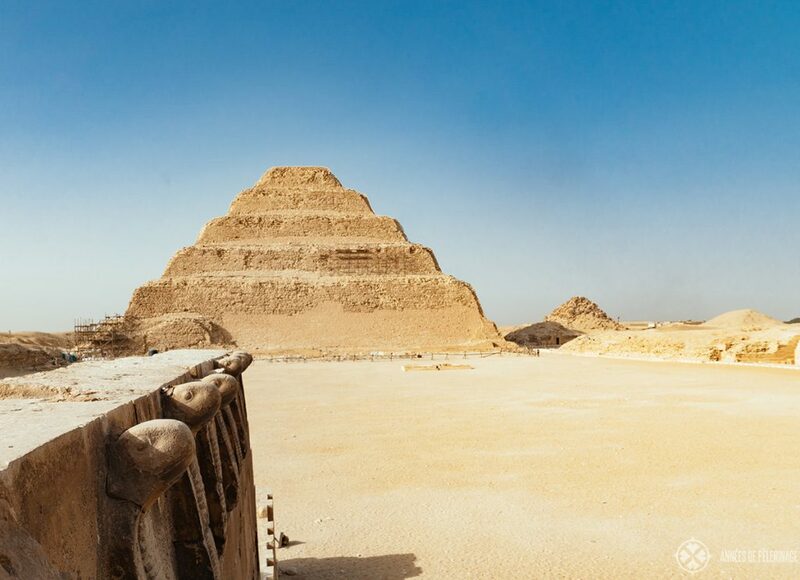 Here is my full guide to visiting Saqqara on a day trip from Cairo. I especially loved walking along the roofed colonnade corridor with some of the stones looking like they were hewn from their quarries 10 years ago and not almost 5,000! 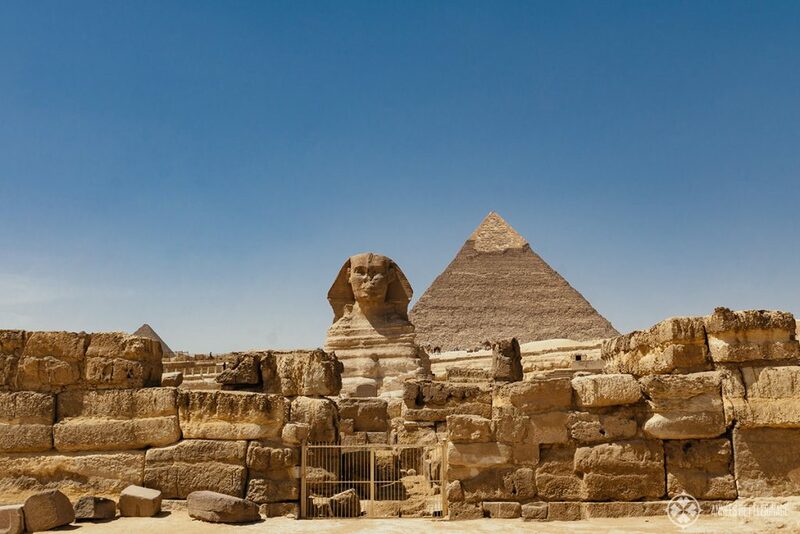 Hint: I’d book a Pyramid tour in Cairo where you visit Giza and Saqqara in one day. 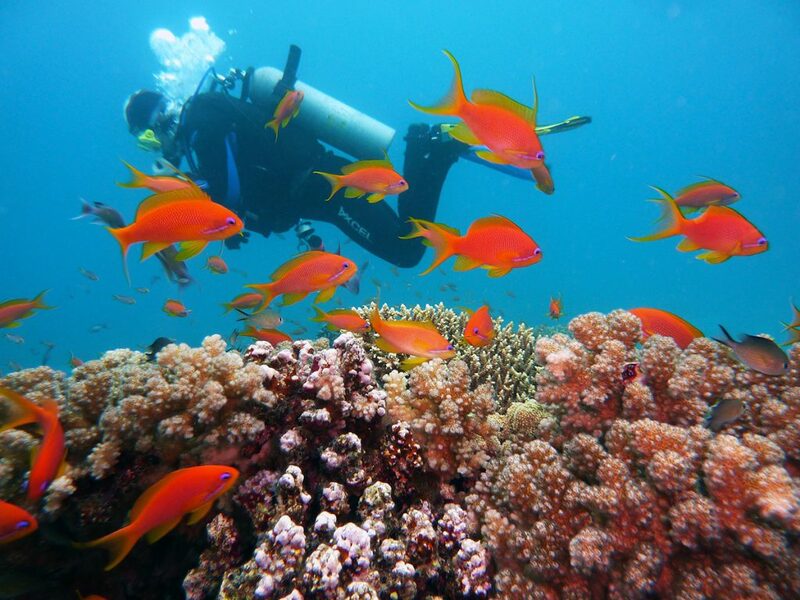 Sharm el-Sheikh or Hurghada – Egypt has quite a lot of famous snorkeling hotspots on the Red Sea. Most of the resorts are spectacular and considerably cheap (so quite popular among European vacationers). But no matter if you pick a luxury hotel or not, you will have access to the bountiful and incredibly colorful maritime life of the Red Sea. The best part: It’s one of the few free things to do in Egypt, as all temples will require a ticket. 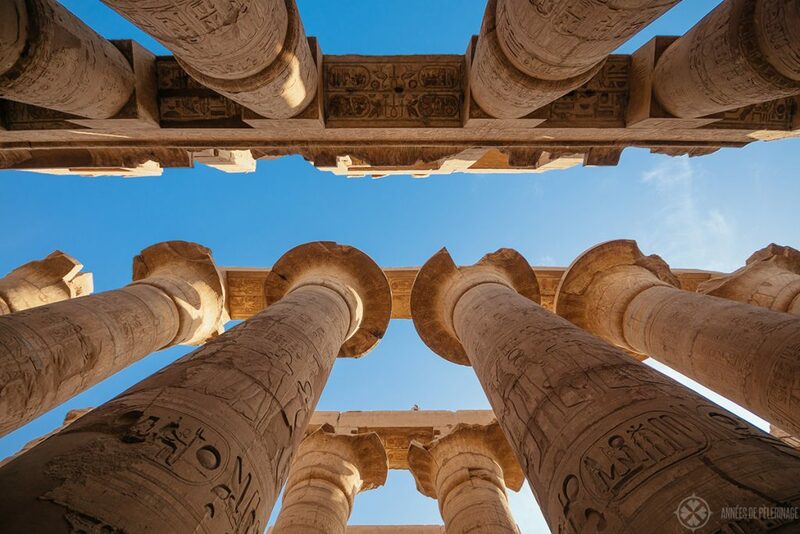 Tip: Explore the temples and historic sites of Egypt for a week and then add another relaxing week of sunbathing and snorkeling at the end of your Egypt itinerary. 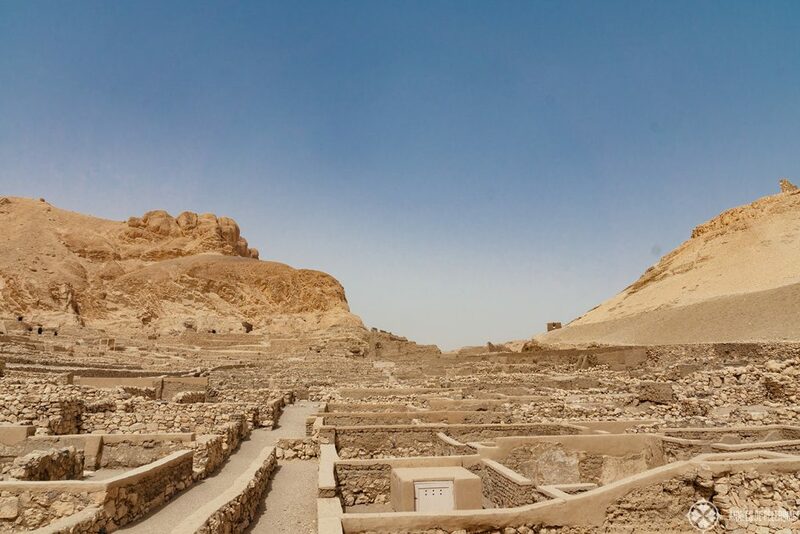 Maybe the most impressive mortuary temple ever built in ancient Egypt is dedicated to the female Pharao Hatchepsut. It lies beyond the valley of the Kings (and there is said to be a tunnel connecting the two) and was expertly restored by Polish Academy of Sciences in Warsaw. As a result, it is also one of the top sites in Egypt, but that shouldn’t keep you from going. 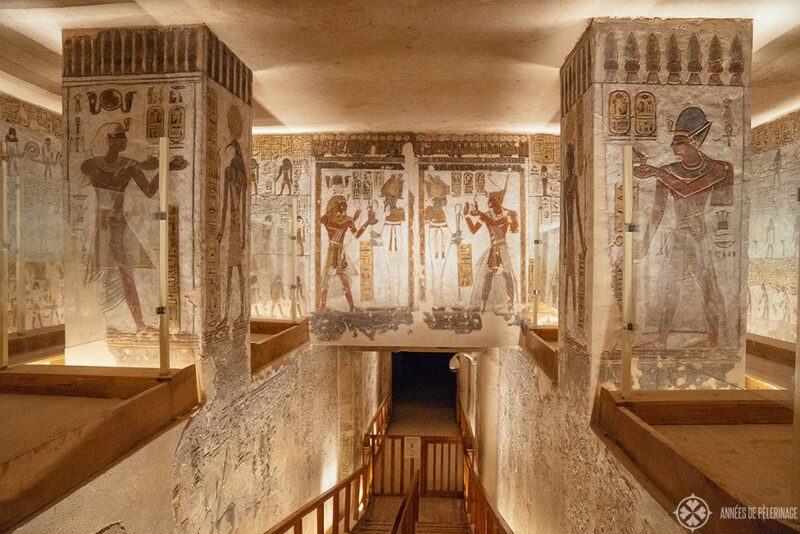 The vistas from the entrance are just too picture-perfect and there are some famous murals to be seen inside (like Hatshepsut’s expedition to the kingdom of Punt). As far as sightseeing in Egypt is concerned, it really doesn’t get any better. The place is just so beautiful. It’s tempting to limit your Egypt itinerary to famous landmarks from the Pharaonic times, but you really shouldn’t shun more recent Islamic history. 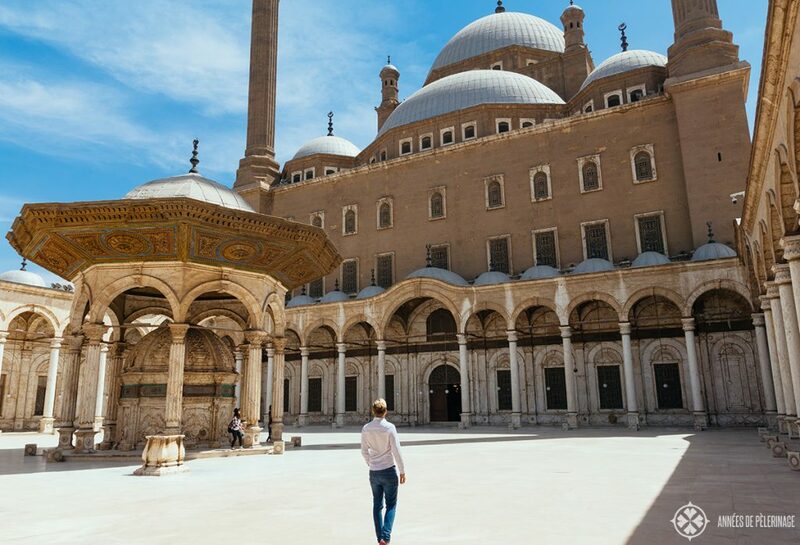 In Cairo, you absolutely have to visit the old citadel with it’s imposing Muhammad Ali Mosque. It’s often called the Alabaster Mosque due it’s exterior of alabaster tiles. 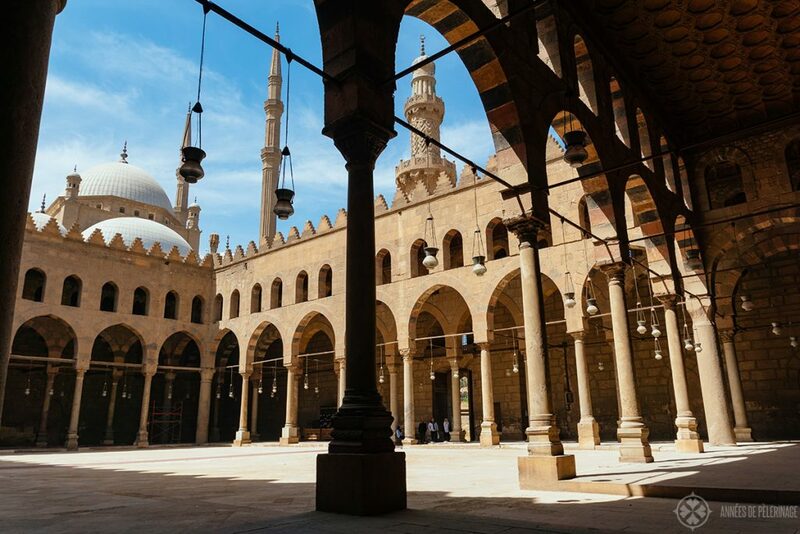 Also, make sure to visit the Al-Nasir Muhammad Mosque inside the Cairo Citadel. I actually liked it more than the Muhammad Ali Mosques as it feels more balanced and I generally like older buildings more. There are a couple museums inside the Citadel as well and the view of the city is just stunning. Absolutely put it on your list of things to do in Cairo. Read my full guide to the Cairo Citadel here. 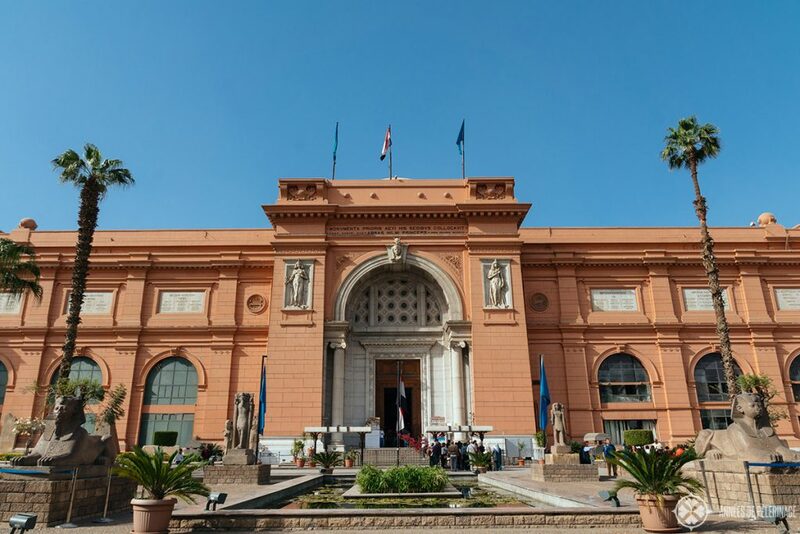 While in Cairo, there is literally no way around visiting the Egyptian Museum. 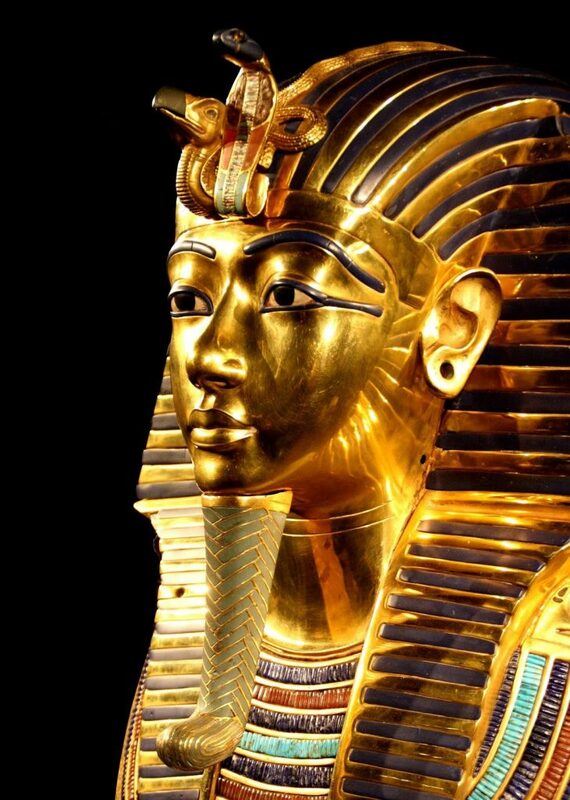 It is here the famous hoard from Tutankhamun’s tomb is exhibited (for now). For me, gazing once into the ageless golden face of the ancient child king was a dream come true. Sadly, the museum is a mess. There are barely any inscriptions, the conservative measures will make you cry and security is at such a low level that it’s a wonder there are any undamaged artifacts remaining. Note: Starting from May 2018, the famous collection will be relocated to a new museum in Giza called “Grand Egyptian Museum”. So, you will probably have to visit both sites. 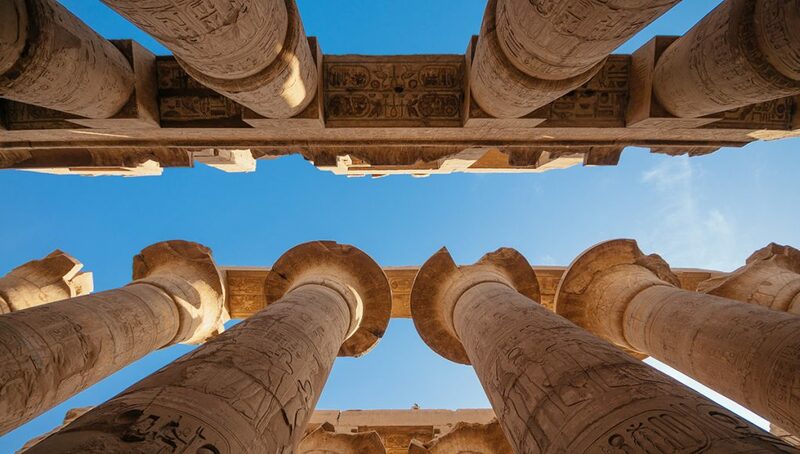 Luxor is home to the greatest temples in the ancient world. And no other temple is bigger than the Karnak temple dedicated to Amun-Re. Most of what you see now was built starting from the eighteenth dynasty, but the history of the vast temple reaches back to the murky past of the Middle Kingdom and the Eleventh Dynasty (so around 2100 BC). 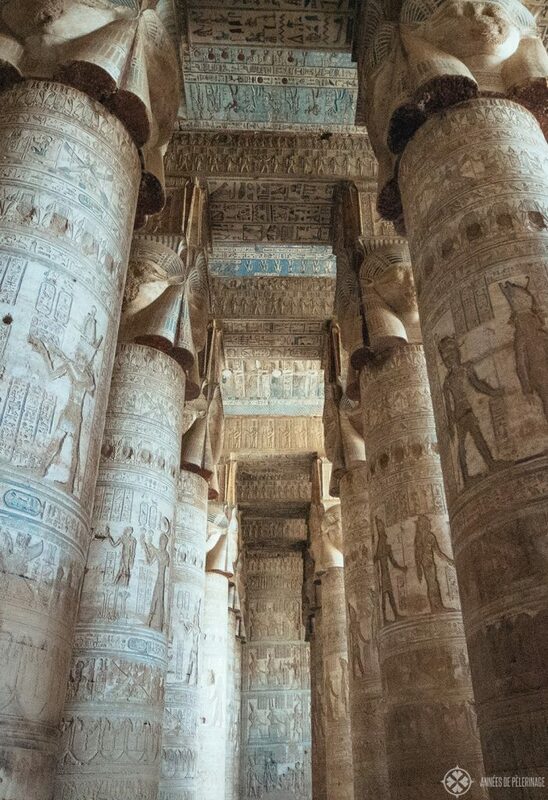 The temple is particularly famous for its great hypostyle hall with its 134 massive columns of up to 21 meters. It almost feels like a maze! Definitely, remember to bring a wide angle lens to capture the ancient perfection. 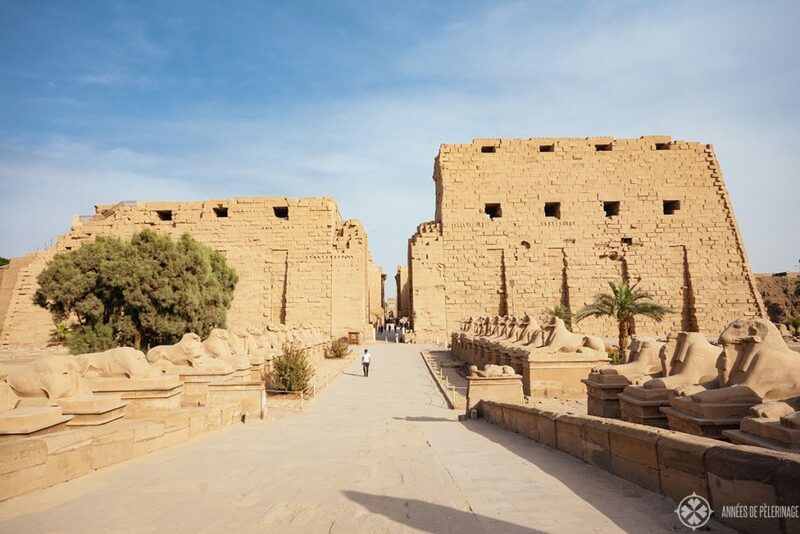 Note: An avenue of thousands of sphinxes, covering a distance of around 3 kilometers once connected Karnak with the Luxor temple. 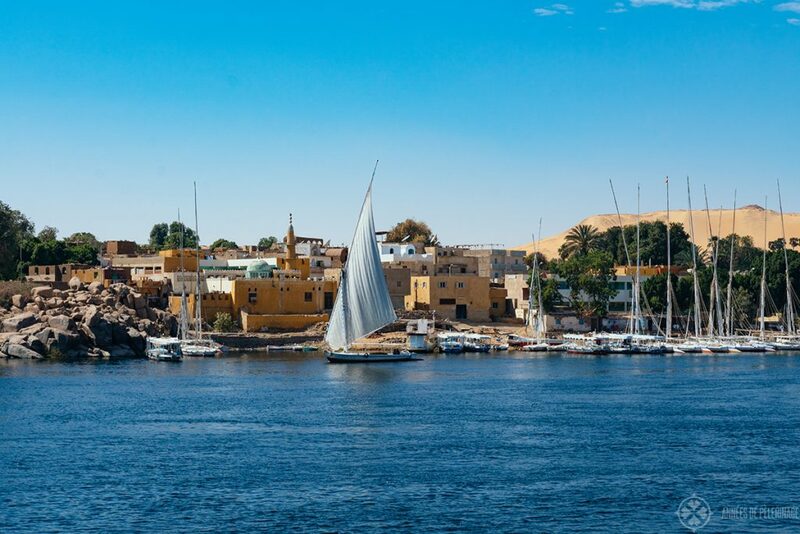 Felucca are the ancient Egyptians boats sailing the Nile ever since the time of the Pharos. It’s my honest opinion that you definitely need to put a felucca ride on your list of things to do in Egypt. There is something archaic, and yet so relaxing about it. On board, everything seems to slow down as the small sails capture the ancient essence of the Egyptian winds. a) There is a staircase leading to the roof of the temple. Once a year and important festival was celebrated here. The staircase is lined by a quite precise depiction of the procession involved in the festival, while the structures on the top surprise with their quite graphic themes. b) Dendera is home to a couple of important murals depicting the zodiac signs and one of the earliest renditions of the zodiacs (the so-called Dendera zodiac, now in the Louvre). We often think of Egypt as one country along the Nile, but the pharaonic history is anything but linear. Egypt was divided more often than it was united. One of the boarding countries of the pre-dynastic Egypt was Nubia. Ramesses and many other Pharaohs conquered the Nubians, yet they do remain as a distinct ethnic minority within Egypt until this day. The skin tone is considerably darker like you would see in central Africa and so are the rhythms of their music. 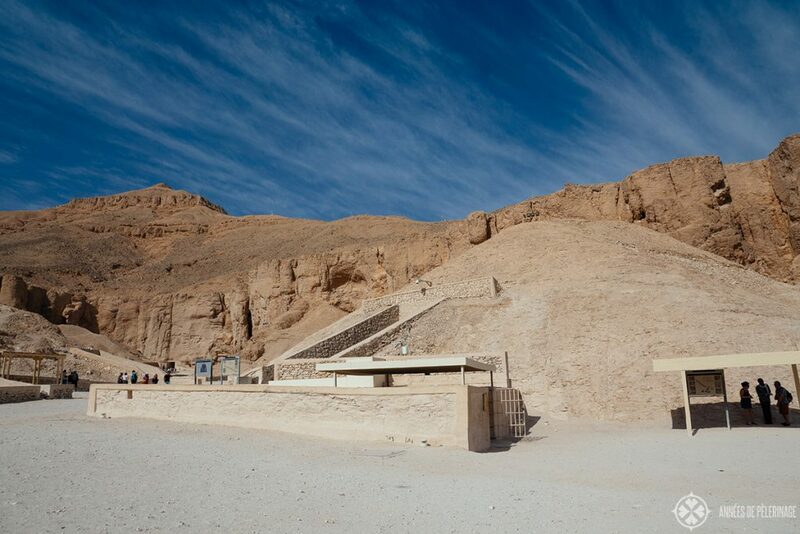 The valley of the kings and the adjacent valley of the queens is the most prominent burial site in Egypt. But the Pharaohs always faced the problems of graverobbers. They knew fairly well that the tombs of the earlier dynasties, especially the pyramids were robbed down to the last gram of gold. This was one of the main reasons to move from visible to fairly invisible and hidden tombs. But tombs had to be built and so you always had the risk of the workers coming back. This is why the village of Deir el-Madina was founded. Here the artisans were living, quite like in a prison, to build the tombs of the kings, queens, and nobles in the villages nearby. Once there, no family was allowed to leave. In their rare spare time, some of the supervisors build their own tombs. Uniquely colorful, with details from the everyday life. One of the hidden gems in Egypt. 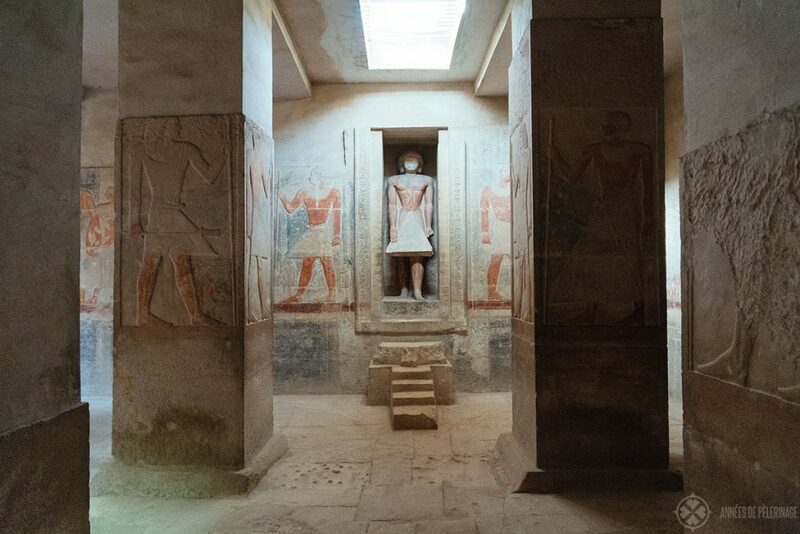 One of my personal highlights on my tours through Egypt was the tomb of Mereruka (~2340 BC). He was one of the Vizirs during the sixth dynasty and built himself a huge and extremely elaborate mastaba (burial house). The tomb, while found empty, is especially significant, as it depicts a lot of scenes from everyday life. Fishing, hunting, dancing, and even a jewelers workshop made it to the especially realistic reliefs on the walls of Mererukas tomb. Not many tourists come here, even though it’s quite close to Djoser’s step pyramid. A true insider tip. Today, no crocodiles remain in the lower Nile. The building of the High Dam, but also hunting led to their extinction in the lower regions. This was once different. 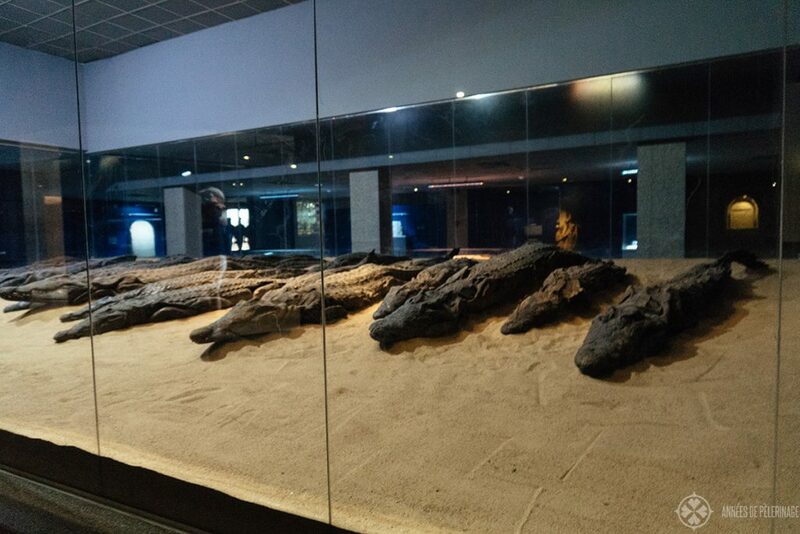 In fact, the crocodile was quite revered during the Pharaonic times. The temple of Kom Ombo, where mummified crocodiles were found, is just one testament to their significance. Sobek was the name of the crocodile-headed god that was revered here. 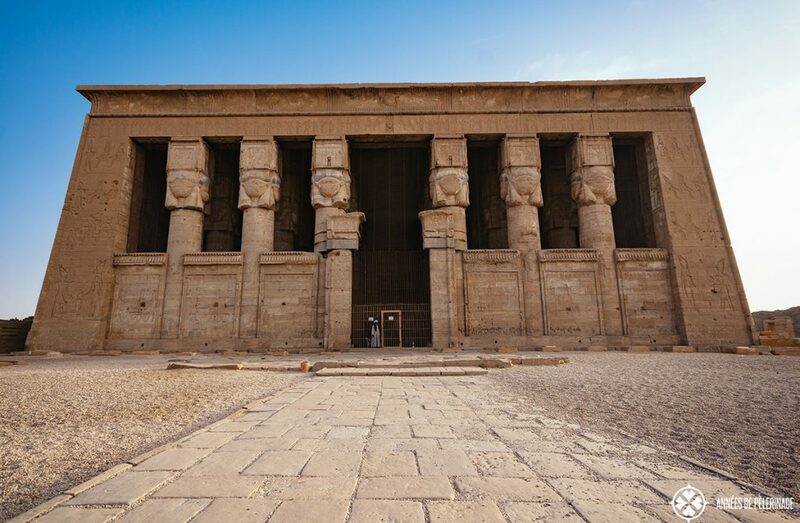 The temple structures dates to the Ptolemaic times (so around 180 BC) and is unique as it’s actually a double temple. There are two entrances and two holy shrines within (the other side was dedicated to Haroeris, a version of Horus). You can find one of the two remaining Nile-o-meters here. A structure to measure the height of the year’s Nile flood which was used to set the height of the tax (high flood equals high fertility and thus a better harvest). 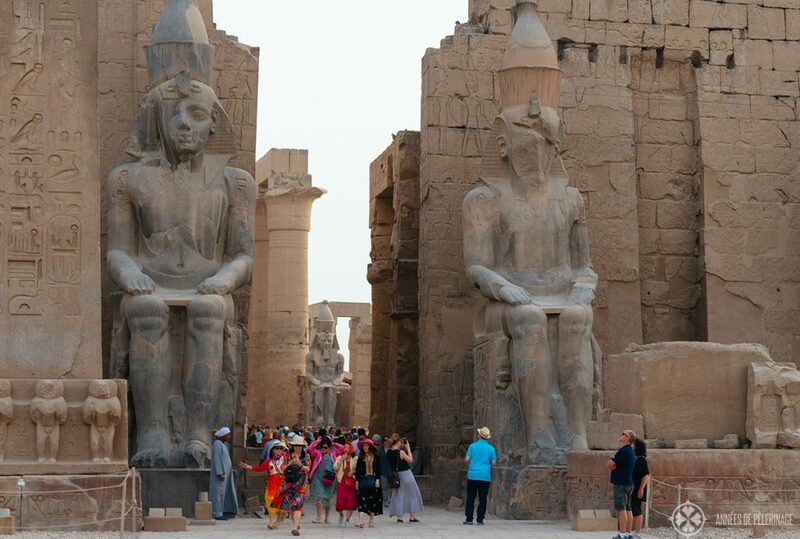 Another important temple you absolutely have to visit in Egypt is the Luxor temple. Some say it is here where all the Pharaohs of the New Kingdom were crowned, and even Alexander the Great claimed to have been crowned here. Setting speculation aside, the temple, with its grand obelisk is incredibly impressive and easy to access. 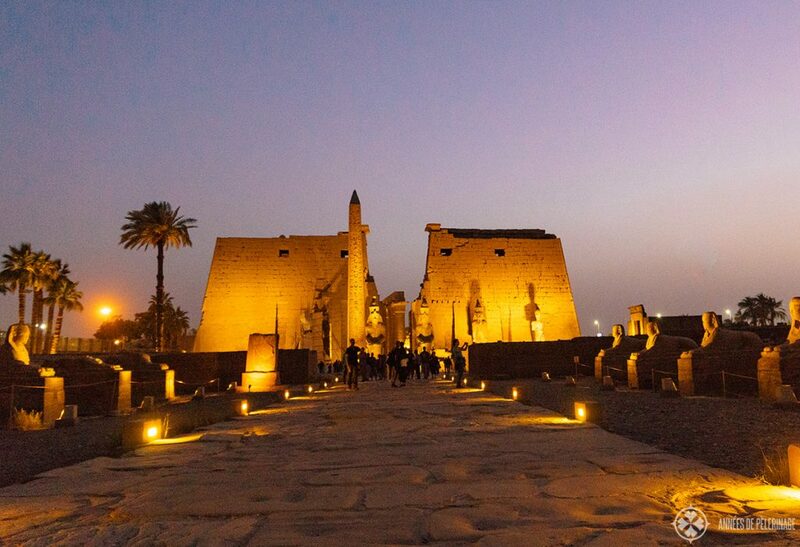 It’s, more or less, situated in the middle of modern Luxor, right on the banks of the Nile. Ramesses the II and Tutankhamun were probably the most important patrons, but construction started as early as 1600 BC. Note: Visit 1 hour before sunset. The temple is beautifully illuminated at night, so you get to see it in both lights. 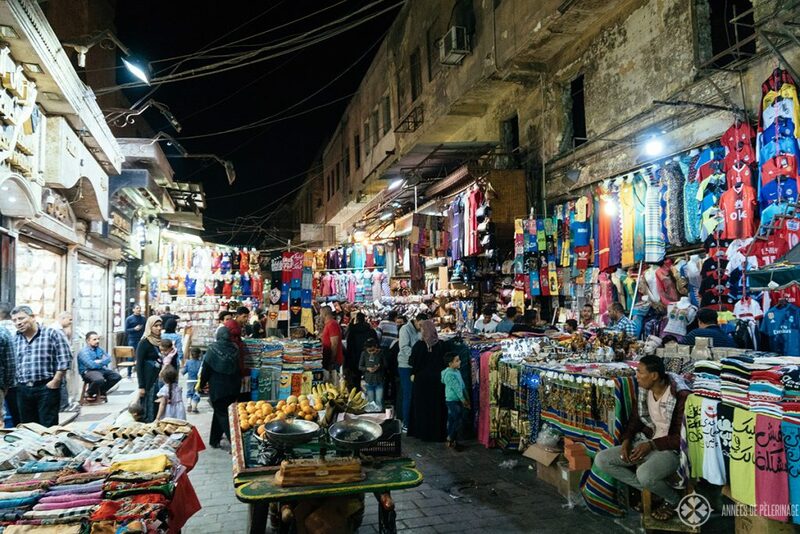 Cairo, Aswan, Luxor – there is virtually no city in Egypt without a bazaar. Winding alley, often close to a mosque, where vendors showcase their wares. Souvenirs, spices, and clothes can be found in copious amounts, with a barbershop and some cafés sprinkled in between. The sounds, light, and smells are quite dazzling, and it’s one of the best things to do in modern Egypt. Do visit after sunset, when the locals are around, keep your valuables in safe place and remember to haggle. Most importantly, know what you want to buy and what you don’t want to buy. The local vendors are extremely good at charming you into buying stuff. They’ll ask for your name and where you are from, offer you “presents” or start little games, and before you know it you have to hand over some “baksheesh” (Persian for a tip) because of the sister of the vendor is, incidentally, getting married tomorrow or whatever other cover stories they come up with. 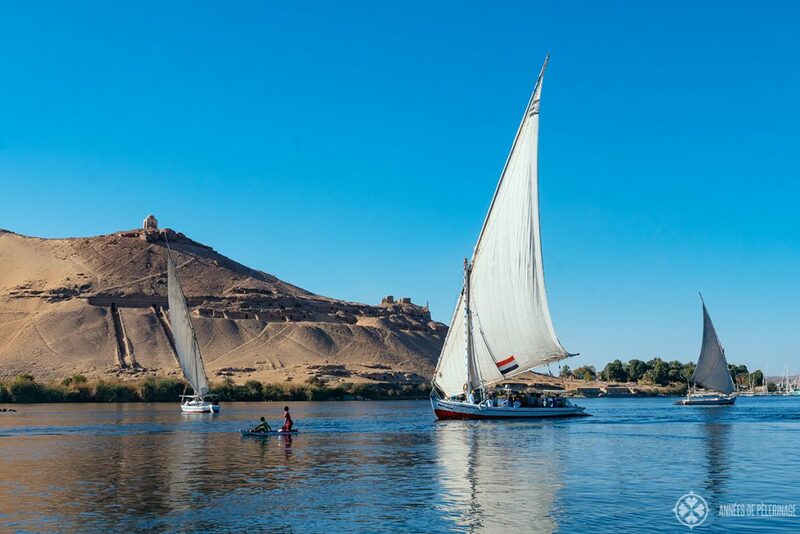 Probably the best way to get in contact with ancient Egypt is a Nile cruise. The Nile is its lifeline and ever was. So, almost all Pharaonic structures and historical places in Egypt can be found on the grand river’s banks. With the decline of the tourists in recent years, not many cruise lines are still operating (from once over 300 ships, 60 remain). 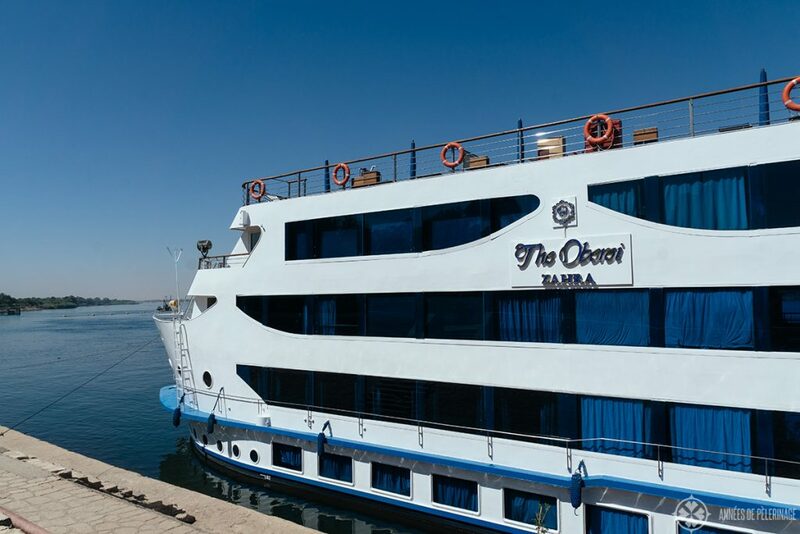 I toured the Nile on a 7-day cruise on the Oberoi Zahra (read my review here) and thoroughly enjoyed the luxury this unique riverboat had to offer. It’s not the cheapest option, BUT they offer by far the best excursions, their food is safe (an important factor in hot Egypt) and the best service. Note: While not affiliated with Oberoi at all, I get commissions for bookings made through this link. Why did I not include them? Some of them are quite dangerous to visit (like Sinai), while others (like quad riding in the desert) can be done anywhere and are not special to Egypt. 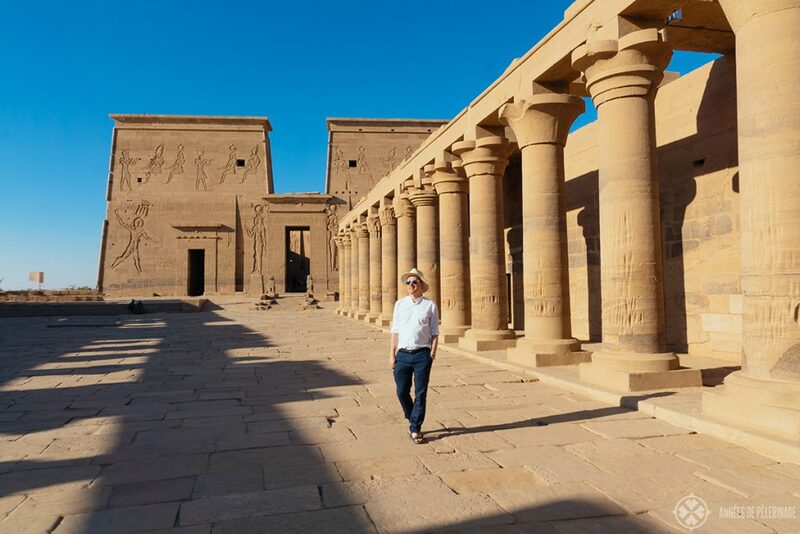 I am a huge history buff and to me, a visit about Egypt is all about getting in contact with the remarkable remains of a history stretching 5,000 years and beyond. Know then, that a lot of tourists will prefer to visit places Hurghada (or other tourist sites close to the Red Sea) and only do one (or two) day trips to see Luxor and the west bank. When I told my friends I was visiting Egypt, a staggering amount asked me whether it is safe. This shocked me quite a bit. Egypt is perfectly safe for western tourists. Sure, there was the aftermath of the Egyptian revolution in 2011 and the reign of the Muslim Brotherhood where it was not too advisable to visit. There also have been quite a couple of terroristic shootings in the past. BUT: The Egyptians learned from these mistakes. There is no tourist attraction which is not protected by the military and often overland tourist buses are accompanied by a motorcade. I didn’t feel unsafe a single minute, though I have to add that seeing all the military leaves some weird aftertaste. Using your common sense probably helps as well. That isn’t to say that there will not be any terror attacks in the future. Sadly, not even the tightest security will be able to prevent it – as incidents in London, Paris or Las Vegas illustrated. From my perspective, and as long as you don’t visit the Sinai or the Gaza strip, the only thing you really have to worry about is getting scammed. Violence or petty crimes against tourists are exceedingly rare and the Egyptians are, generally speaking, extremely friendly towards strangers. That doesn’t keep them from trying to squeeze some Egyptian Pounds from you. The money changing trick and the present trick are the most common. Now, you are probably wondering “when is the best time to visit Egypt?”. Generally speaking, you really should avoid the summer. So June, July, and August really are way too hot (temperatures above 60° Celsius / 140° Fahrenheit. Exploring the temples and especially the tombs will be unbearable. As it almost never rains in Egypt (like 5 days a year), the rest of the years is up to your personal preferences. Sandstorms are more frequent in spring, so October or November is quite perfect if you want blue skies and temperatures between 25° and 30° Celsius (77 to 86°F). But February to early April is just as good for exploring the temples and Pyramids, while still enjoying warm temperatures. If you want to go snorkeling and do want to get a tan, April, May or October are probably the best times to visit Hurghada or Sharm el-Sheik. January and December are considerably cooler and you won’t want to run around in shorts. Especially the nights can be somewhat chilly. Last, but certainly not least, I got a special treat for you! You can now download my full Egypt itinerary with tons of suggestions and tips for free! Just enter your e-mail adress in the form below and i’ll send it to you! So, this is it! This was my guide to the best things to do in Egypt. Got any questions? Leave a comment below. Liked my guide? Pin it to your Pinterest board! Amazing post and Egypt is a very beautiful place. I just love your article. Egypt is number one on my bucket list. And good tips on travel agencies to go threw? And the most important thing that should be included in your trip/tours. Hopefully I will be able to see the one place I am absolutely infatuated with. Thanks again for all of your help. hi. nice article. We are planning a family trip in Jan ’18. total days we have got are 7. What all should we cover in these many days? how is travelling by train from Cairo to Luxor? Taking the train from Cairo to Luxor is entirely feasible. As most tourists take the sleeper-train you can save one night in a hotel. That being said, I have no experience with it myself, as so far taking the plane worked out better for my Egypt itinerary. Do you suggest staying in one city and taking excusions? well you could stay in Cairo for a bit, then move on to Luxor, and last to Aswan and then fly back. Or you just stay in Cairo and take a Nile cruise. Love ur article, were going to Hurghada 1st two weeks in July, an with what u have said. I to have had plenty said to me about it I say it,s as safe as any other country. Thankyou for advise while there. I cant wait to go! I’m sure you’ll enjoy Egypt. And thank you for your kind words!